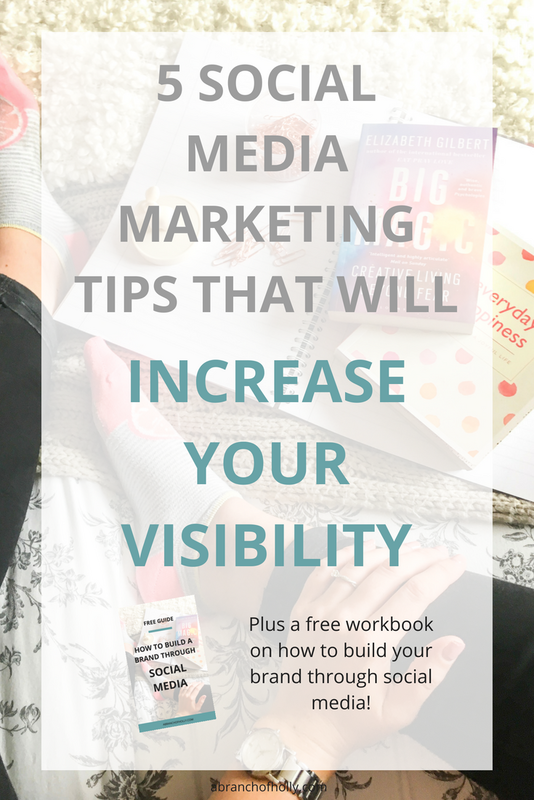 I bet you’ve read loads of posts about social media marketing tips, right? And I bet at some point you’ve thought you’ll never get a breakthrough with your online presence. But social media is one of the most powerful tools we can use to increase our visibility. We always seem to come across a problem though. Time and effort on social media doesn’t always translate into real results. But since 49% of users in the 18-29 age range report purchasing something after seeing a social media ad for it and content marketing generates three times as many leads, it’s time to turn that effort into results. If you’ve been using the same strategies for your social media but they're not converting the way you’d hoped, keep on reading. These are the real reasons why your content isn’t converting and five social media marketing tips to fix them. Want to learn how to effectively grow your brand through social media? Good, because I made this workbook for you! Grab it below. One of the biggest social media marketing tips I can give you is this: you’ve got to know what sets your brand apart in your industry. If you don’t, how do you expect your audience to get your message? Social media is a great way for you to demonstrate your personality and what makes you unique. And before that mindset block appears, think about it this way instead. No matter who you are or what your blog or brand is all about, you are a reflection of it. It’s a noisy world online. That means by positioning yourself as an expert and a thought leader in your industry, you’re going to increase your visibility, not hurt it. I bet you can think of people right now that have huge personal brands that you admire. For me a few names come to mind, including Sunny Lenarduzzi, Amy Landino, In The Frow. Each of them represents who they are as well as their brand, and the trust flows through consistently. You can do the same. And once you do, creating content that your audience connects with will become so much easier. Instead of throwing different strategies at the wall hoping they’ll stick, your audience will be telling you what they’re looking for. That means they’ll be connecting with you on a personal level. They’ll become your cheerleaders and will want to share the content you’re putting out there. #2 | WHAT’S IN IT FOR YOUR AUDIENCE? People don’t have time to look at your content for minutes, let alone hours. We all have short attention spans. There’s only a certain amount of time available to research, interact and decide what they’re going to consume. Get clear on what problem you’re solving and how you personally create a positive outcome for your reader. Incorporate this answer into every piece of content, from your social media posts to your online conversations. Make sure all your posts and daily interactions all have a clear call to action. You don’t want to leave potential audience members guessing what your brand is all about. What if they guess wrong? When it comes to social media marketing tips, you might think this is pretty basic, but it’s still important. You’ll never increase your traffic or visibility if your content is boring and lifeless. Get creative. You want every single piece of your content to scream YOU! Building an online presence is about being human. People won’t want to connect with someone who is unappealing to them and boring. They’ll only connect with you properly once they build up that know, like, and trust. Your aim is to create content that appeals to your audience in a creative way and speaks their language too. If you add in the creative aspect, you’re adding a new level of personality which will make your content truly reflect who you are. If your purpose with social media is to simply spam your feed with promotional content, then you’re doing something wrong. That’s not the point. It’s called social media for a reason. The best way to get results is to talk about things that matter to your audience and create curiosity and brand awareness through conversation. But I bet sometimes you wonder what you can talk about, right? Is there a question your readers ask you over and over again? Good. Find a way to answer it. Think about how many different pieces of content you could turn that into - a blog post, a quick tip, podcast episode, YouTube video...the list goes on. On social media, you’ve got an hour to respond before you lose a potential lead. It’s simply really. Your potential reader or customer has taken time to reach out to you with a comment, problem or question. If you don’t respond in a timely manner, then you’re disrespecting them. Put some templates together for your frequently asked questions. You could also put a plan in place to address any questions they might have and a system for following up after an initial contact. If you have a system this will create consistency. This helps you build trust and stay at the forefront of your readers’ minds. And never forget about a potential lead. Never leave them hanging. You don’t want to leave their decision up to chance. Always give more options. Provide them with additional details and encourage them to take a next step. Your follow up could come in the form of a tweet, email or even a Skype call. Whatever appropriate way of communication is best. But never ever forget to make that point of contact. Creating valuable content to communicate your thoughts and ideas is honestly one of the best social media marketing tips I can give you. But not all content is created equal. Create content with your audience and they journey in mind. What do you need to do to raise awareness, nurture those relationships and activate them into becoming part of your community? What do they need to know from you to make a positive decision? Give them every reason (and then some) to take that next step with your brand and online presence. Which of these social media marketing tips resonated with you the most? P.S. Don't forget to download your free workbook on how to build your brand through social media!